With bountiful, devastating detail, Brown describes how scientists, doctors, and journalists—mainly in Ukraine and Belarus—went to great lengths and took substantial risks to collect information on the long-term effects of the Chernobyl explosion, which they believed to be extensive. Other researchers have issued a much sunnier picture of post-Chernobyl ecology, but Brown argues persuasively that they are grossly underestimating the scale of the damage, in part because they rely too heavily on simplistic measurements of radioactivity levels. Radiation has a special hold on our imagination: an invisible force out of science fiction, it can alter the very essence of our bodies, dissolve us from the inside out. But Manual for Survival asks a larger question about how humans will coexist with the ever-increasing quantities of toxins and pollutants that we introduce into our air, water, and soil. Brown’s careful mapping of the path isotopes take is highly relevant to other industrial toxins, and to plastic waste. When we put a substance into our environment, we have to understand that it will likely remain with us for a very long time, and that it may behave in ways we never anticipated. Chernobyl should not be seen as an isolated accident or as a unique disaster, Brown argues, but as an “exclamation point” that draws our attention to the new world we are creating. “………As her book’s title, Manual for Survival, suggests, Kate Brown is interested in the aftermath of Chernobyl, not the disaster itself. Her heroes are not first responders but brave citizen-scientists, independent-minded doctors and health officials, journalists, and activists who fought doggedly to uncover the truth about the long-term damage caused by Chernobyl. Her villains include not only the lying, negligent Soviet authorities, but also the Western governments and international agencies that, in her account, have worked for decades to downplay or actually conceal the human and ecological cost of nuclear war, nuclear tests, and nuclear accidents. Rather than attributing Chernobyl to authoritarianism, she points to similarities in the willingness of Soviets and capitalists to sacrifice the health of workers, the public, and the environment to production goals and geopolitical rivalries. When the United States dropped atom bombs on Hiroshima and Nagasaki, the immediate effect was a huge single release of radiation. Radioactive fallout then drifted down from the sky, moving with the wind to distribute a smaller amount of radiation across a larger area. People who arrived in Hiroshima after the attack fell ill, including US soldiers helping to rebuild the city, and the Japanese press wrote about the longer-lasting effects of the “atomic poison.” This infuriated General Leslie Groves, head of the Manhattan Project, who could not countenance the possibility that the hugely expensive new weapon might be vilified and banned, as German mustard gas had been during and after World War I. Groves directed an effort to use censorship and propaganda to suppress information about the dangers of the radiation emitted by the atom bomb. The US did sponsor a “Life Span Study” of Japanese bomb survivors, which yielded valuable information. But it only started in 1950, too late for comprehensive results, and it only factored the initial blast, not fallout, into its estimates of radiation exposure. This meant that it excluded from consideration potentially radiation-induced health problems connected to lower doses of radiation, such as leukemia, thyroid cancer, diseases of the circulatory system, autoimmune disorders, eye diseases, and increased vulnerability to infection…….. The Soviet Union had access only to the published results of the “Life Span Study.” But the rapid development of Soviet nuclear power, and the many accidents that accompanied it, provided extensive opportunities to examine the effects of radiation on the human body. By the time Dr. Angelina Guskova cared for Chernobyl responders, she had already treated more cases of radiation illness than anyone in the world. During years of work at a secret Siberian nuclear weapons installation where she was forbidden to ask her patients about the nature of their work, and thus about their radiation exposure, she learned to estimate radiation doses from victims’ symptoms, and she made substantial inroads in the treatment of radiation-related illness. She helped contribute to the Soviet definition of “chronic radiation syndrome,” which included malaise, sleep disorders, bleeding gums, and respiratory and digestive disorders. 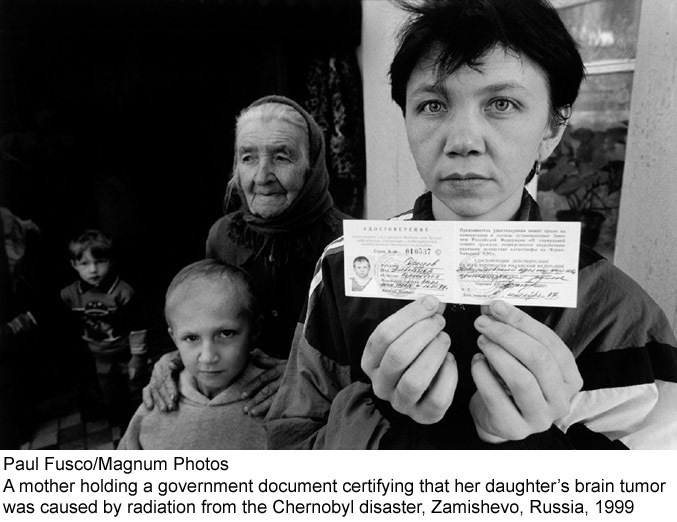 Guskova’s findings, like the many nuclear accidents that occurred in the Soviet Union in those years, were kept secret. Chernobyl provided an opportunity to gather a vast body of knowledge about the effects of radiation exposure, but politics trumped science. In the 1990s, when studies of Chernobyl should have been in full swing, Americans and Europeans were suing their governments for exposing them to radioactivity through nuclear tests and accidents—hardly a situation in which Western governments would wish to publicize the many harms of long-term exposure. International agencies and diplomats worked to minimize reports of Chernobyl’s damage. Despite calls from scientists from many countries, there has never been a large-scale, long-term study of its aftermath. In 2011, when an earthquake caused an accident at the Fukushima Daiichi nuclear power plant in Japan, there was still no firmly established understanding of the effects of chronic exposure to lower levels of radiation, or of the ways in which radioactive fallout continues to circulate years after a disaster. With bountiful, devastating detail, Brown describes how scientists, doctors, and journalists—mainly in Ukraine and Belarus—went to great lengths and took substantial risks to collect information on the long-term effects of the Chernobyl explosion, which they believed to be extensive. When Soviet authorities were unwilling to accept their results or act on their warnings, these activists put their faith in foreign experts. They were sorely disappointed. In 1989, under public pressure, the Soviet Minister of Health requested that the World Health Organization send a delegation to the area around Chernobyl to determine what levels of radiation were safe for humans. The WHOselected a group of physicists who had already issued reassuring statements about the effects of the radiation spread by the accident. (Brown implies that this selection was connected to pressure from the world’s nuclear powers.) This group soon concluded that there was no association between Chernobyl fallout and the reported rise in noncancerous diseases such as circulatory or autoimmune disorders, and recommended a dramatic increase in the guideline for “safe” lifetime doses of radiation. A 1990 assessment by the International Atomic Energy Agency (IAEA), meanwhile, was sabotaged by the KGB, which was so desperate to conceal sensitive information from foreigners that it stole a large registry of patient data kept on a single computer in Belarus. (It was never recovered.) According to Brown, the IAEA ended up producing inaccurate estimates of radiation exposure, in part because it grossly underestimated the use of contaminated local products by people living around the Zone—especially berries, mushrooms, and milk. The WHO and IAEA results hamstrung fundraising efforts for further Chernobyl studies, and for medical care and resettlement. Ukrainians and Belarusians were told that their health problems were caused by stress and “radiophobia” rather than by radiation itself. The newsreels of the May holiday did not record the actions of two and a half million lungs, inhaling and exhaling, working like a giant organic filter. Half of the radioactive substances Kyivans inhaled their bodies retained. Plants and trees in the lovely, tree-lined city scrubbed the air of ionizing radiation. When the leaves fell later that autumn, they needed to be treated as radioactive waste. Radioactive fallout was distributed far beyond the Exclusion Zone, which was, after all, just a circle on a map. Clouds absorbed radiation and then moved with the wind. Red Army pilots were dispatched to seed clouds with silver iodide so that radioactive rain would fall over provincial Belarus rather than urban Russia. Belarusian villagers fell ill, as did the pilots. Livestock absorbed radiation in the immediate aftermath of the disaster by inhaling air and dust, and later by consuming contaminated grass. Cleaned villages were soon recontaminated by radioactive dust from surrounding areas, and buried material leaked radioactivity into the water table. A reluctance to waste food and other basic goods helped keep the radioactive isotopes in circulation. (Radioactive isotopes are unstable atoms that release dangerous particles until they decay into stable atoms of different elements. Although scientists can estimate the half-life of radioactive isotopes, the process of decay at the level of individual atoms is random.) Contaminated wood and peat were burned for fuel in homes and factories, releasing more radioactivity into the air. The State Committee of Industrial Agriculture had 50,000 animals rounded up and slaughtered during the evacuation from the Zone, and their radioactive wool, hides, and meat sent to different cities for processing. Brown’s findings in a Kiev archive led her to Chernihiv, in northern Ukraine, where workers at a wool factory requested the same benefits received by those who had been at the site of the reactor explosion. The workers had held the Chernobyl wool in their hands and inhaled its fibers. Soon their noses started to bleed, and they became dizzy, nauseous, and fatigued. Their managers pushed them to fulfill their quotas anyway. The authorities eventually made some efforts to clean the factory, but they weren’t willing to bury the highly radioactive wool. Instead, it was piled near the factory’s loading dock, waiting for its isotopes to decay. Wool accumulated for over a year, continuing to emit radiation. Meanwhile, the cleaning efforts caused radiation to be released into the surrounding environment along with the rest of the factory’s waste. Moscow agronomists explained how to make sausage with an “acceptable” amount of radioactive meat, and Chernobyl sausages were distributed across the USSR without special labeling. There were instructions on how to salvage contaminated milk, berries, eggs, beets, grain, spinach, potatoes, mushrooms, and tea—often by converting them into products with long shelf lives and simply storing them until the isotopes decayed. This misguided thriftiness was not a uniquely Soviet or authoritarian practice. Chernobyl fallout had contaminated much of Europe. When Italy rejected 300,000 tons of radioactive Greek wheat, Greece refused to take it back; the European Economic Community eventually agreed to buy the wheat, which was blended with clean grain and sent to Africa and East Germany in aid shipments. The difficulty of the cleanup was increased by the fact that the Chernobyl plant had been built in a marshy area, the worst possible type of land for a nuclear disaster. Mineral-poor soil soaked up radioactive minerals, which were then absorbed by mineral-hungry plants. Meanwhile, seasonal floods spread contaminants into pastureland. Tim Mousseau and Anders Møller, biologists who have been studying Zone ecology since 2000, have found that microbes, worms, spiders, bees, and fruit flies still cannot function normally in the Zone, or that they exist in far lower numbers than they did before the meltdown. This means that leaves do not decay at the normal rate, pollination does not occur often enough to produce the fruit that feeds some birds, birds don’t spread the seeds for new plants, and so on. Other researchers have issued a much sunnier picture of post-Chernobyl ecology, but Brown argues persuasively that they are grossly underestimating the scale of the damage, in part because they rely too heavily on simplistic measurements of radioactivity levels. Because radioactivity can move across so many environments and exposure to it can come in so many varieties, individual doses are hard to measure or even estimate, and a full understanding of radioactivity’s effects requires fine-grained observation at many levels over a long period. We don’t even fully understand the process of isotope decay. Biologists originally expected that the ecological half-life of cesium-137 would be only fifteen years; now researchers predict that it will take between 180 and 320 years for cesium-137 to disappear from the forests around Chernobyl, though they don’t yet know why. Wild berry and mushroom picking is one of the few economic options for people in rural northern Ukraine. In her haunting conclusion, Brown describes a trip to the marshy forest a hundred kilometers from the Chernobyl plant. Pickers bring berries to a wholesaler who checks their radioactivity. The excessively radioactive berries are set aside for use in natural dyes, while the others are mixed with “cooler” berries until the assortment meets EU regulations. According to Brown, these regulations, like the American ones, are disturbingly lax. A nuclear security specialist told her that at the US–Canada border, a truck was stopped after officers detected a “radiating mass,” which they thought might be a dirty bomb. But it was only berries from Ukraine. The truck was allowed to pass.